With this out in Japan it made sense to give it a thread for those who want to discuss. Having it's own thread makes more sense than people trying to bump news threads that no one has posted in in 5 months. The CSA Digivice tri. Memorial is the newest 'prop' style Digivice, based on the 'shining' Digivice from tri. Part 6. Those who ordered from an intermediary will hopefully begin to get messages from their intermediaries to begin final shipping payments in the next few days or weeks. 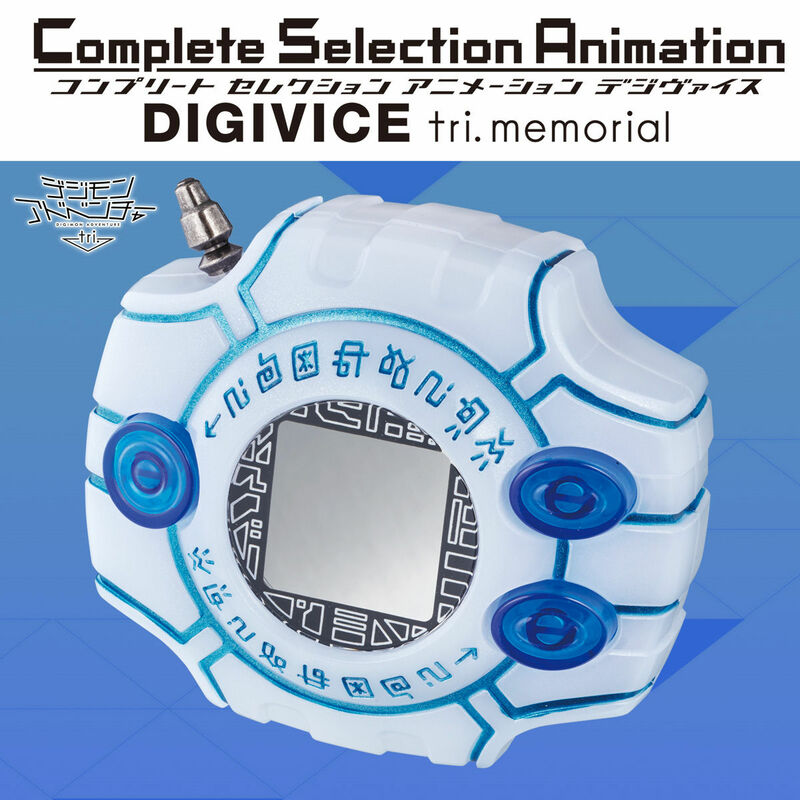 So the CSA Digivice tri.memorial has been released and lemme tell you it's a little bit disappointing. About the key point in my opinion which was Meicoomon's evo line, no Meicrackmon nor Rasielmon and instead Vicious Mode going bananas like in the anime: https://www.youtube.com/watch?v=krA_CB-KXUc and a lots of DAN-DAN™ which is cute I guess. No secret that my favourite scene among all tri. is Meicoomon's farewell. I don't know why you would have expected normal Meicrackmon or Rasielmon in a Digivice specifically themed after the end of tri., they not only don't appear in the anime, there are no hints to them in the anime. An anime tie-in product being faithful to the anime? Surely, you jest. From what I've seen it looks (or rather, sounds) pretty good. Features a longer version of Brave Heart, addressing an issue people took with the original. Features ultimate evolutions instead of warp evolutions this time. Seems that getting the Omegamon voice clip pretty much requires you to cycle through all of Agumon's, and then through all of Gabumon's, which seems like a step back from the old version but I guess it makes sense in context. I think my only real complaint would be the lack of voices of other characters - unless I've missed something - but then I was pretty much expecting Taichi & Agumon, Yamato & Gabumon, and Meiko & Meicoomon to be the focus on this thing. There are a lot of bits of dialogue this time, but they realize there are some questions, such as... What dialogue will Meicoomon have since she doesn't talk when she evolves? Honestly Meicrackmon VM 『Da ga aaaaan! !』is kinda a step back to me. Let's keep in mind that tri. is the only Digimon anime season that hasn't got any proper Digivice with an actual gameplay and not only sounds and lights (along with Appmon if you will) so the treatment the signature Digimon of this series is quite more important than Agumon evolving to Greymon for the 999 time. By the way, not either a trace of Omegamon Merciful Mode's evolution scene: https://www.twitter.com/nue_1225/sta...46694817816576. Overall in my opinion the only thing that worths the while is the cover of the device, which is really cool!!! Last edited by Shadow Shinji; 10-15-2018 at 02:51 AM.